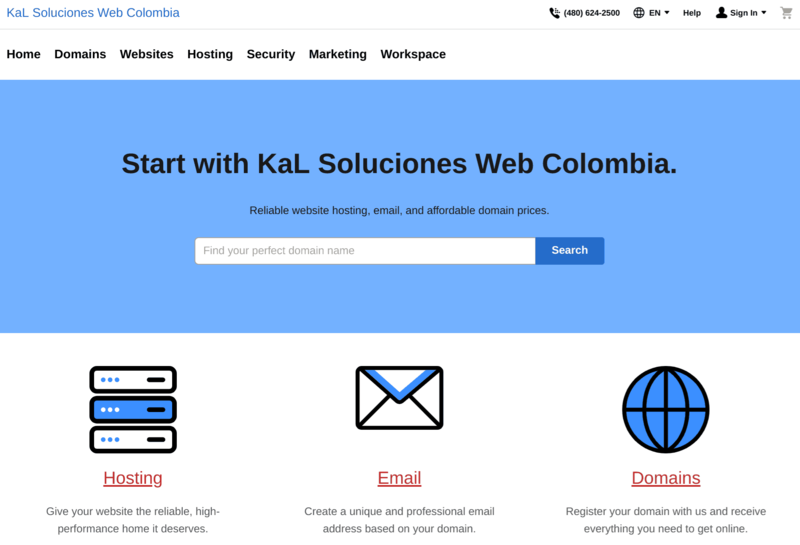 KaL Soluciones Web Colombia Review 2019: Is KaL Soluciones Web Colombia a Good Hosting? Web hosting provider KaL Soluciones Web Colombia was established in 2007. It offers shared hosting, VPS, and dedicated servers as well as email, SSL certificates, and advertising. Established in 2007, KaL Soluciones Web Colombia is a web hosting company that specializes in offering shared hosting, VPS, and dedicated server solutions to individuals and businesses. This vendor’s website went offline for a while, and it has since come back with a more modern look. It is in English (at least when viewed from my location) but includes a drop-down list to translate into more than 50 alternative languages. KaL Soluciones Web Colombia claims to have invested heavily in its data centers. The vendor’s web hosting solutions are designed to handle the traffic and storage requirements of any business in Colombia and beyond. It uses a powerful UPS power backup and a 10 GB connection to guarantee the availability of its customers’ websites. Web hosting solutions include cPanel hosting, Plesk hosting, WordPress hosting, business hosting, VPS hosting, and dedicated servers. All plans include a 99.99% uptime guarantee. The cPanel plans start with one website, 30 GB storage, and unmetered bandwidth and go up to unlimited everything. For the Plesk plans, it’s pretty much the same story. The separate Website Builder plans allow you to create responsive websites complete with SSL, or you can opt for a WordPress plan or a Quick Shopping Cart e-commerce solution. The basic Linux VPS Economy hosting plan – which is best for fast-growing startups and SMEs – includes 1 GB RAM and 40 GB disk space. For businesses with multiple websites and higher resource demands, you can purchase the vendor’s Business Hosting Expand package that comes with 8 GB RAM, 150 GB storage, 4 CPUs, unmetered traffic, unlimited databases, unlimited websites, and a standard SSL certificate. This vendor’s plan prices depend on the kind of package you pick. The Business, VPS, and dedicated server plans are understandably much more expensive than the cPanel and Plesk plans. When it comes to any kind of money-back guarantee, you have to dig deep into the terms and conditions to discover that annual plans will be refunded if canceled within 30 days and monthly plans will be refunded if canceled within 48 hours. KaL Soluciones Web Colombia’s hosting solutions are aimed primarily at Colombian companies and individuals. This company seems to have resolved all the issues with its own website, which confirms its commitment to improving its offerings. Wondering how KaL Soluciones Web Colombia stacks up against other Web Hosting companies? Enter any other Web Hosting company and we will give you a side-by-side comparison.